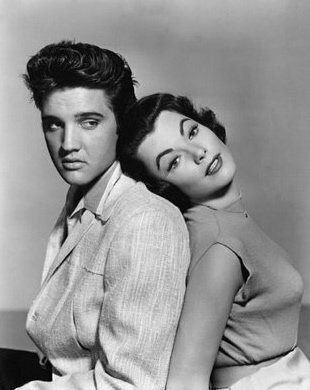 Judy Tyler … Elvis’s Classy Leading Lady in "Jailhouse Rock"
In Memphis on October 17, 1957, actress Judy Tyler made her official entry into the world of Elvis Presley. 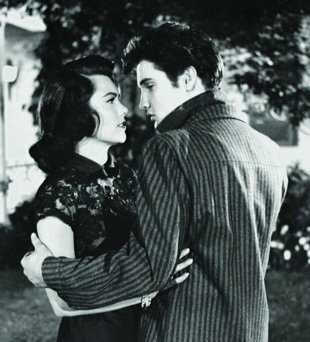 Twenty-six minutes into the premiere of Jailhouse Rock, she walked into a Los Angeles bar and sat down on a stool next to Presley. Awkward glances marked the first interaction of their characters, Peggy Van Alden and Vince Everett. Over the next hour, a strained relationship played itself out on the screen, culminating in romance in the film’s final scene. For many in the audience that night, it must have been a surreal experience watching Judy Tyler in the debut of Jailhouse Rock. They all knew that she had died over four months earlier. Even all these years later, it can be a touching experience viewing the final scene of Jailhouse Rock, knowing that just three weeks after it was filmed, the leading lady’s promising career tragically ended on a lonely Wyoming highway. Born Judith Mae Hess on October 9, 1932, in Milwaukee, Wisconsin, Judy Tyler was raised by parents familiar with show business. Her father, a building contractor, had played the trumpet in big bands, and her mother had been a chorus girl. In her youth, Judy studied ballet, music, and acting. In 1948, at age 15, she left school to go into modeling. The following year she was named “Miss Stardust” in a nationwide contest. Soon afterwards she moved to New York City and got a job dancing in the Copacabana chorus line. There she met her vocal coach Colin Romoff, whom she later married. After working in several New York nightclubs as a singer, Tyler got her first national exposure in 1952 when she began a three-year run as Princess Summerfall Winterspring on the Howdy Doody TV show. In 1955 she landed a roll in the Broadway production of Pipe Dream. An amicable divorce from Romoff in 1956 was followed by another marriage to TV actor Gregory LaFayette in March 1957. 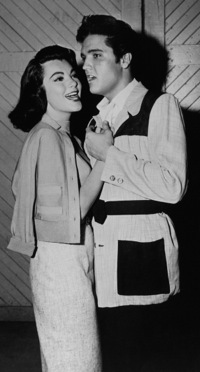 The couple then traveled to Hollywood for what were to be the last four months of Judy Tyler’s life. They were eventful months for Judy. She had a substantial role in “The Case of the Fan Dancer’s Horse,” the first Perry Mason TV episode to be filmed (though not the first one broadcast). She starred in her first film, the forgettable Bop Girl Goes Calypso, and then landed a breakout part as Elvis Presley’s love interest in Jailhouse Rock. 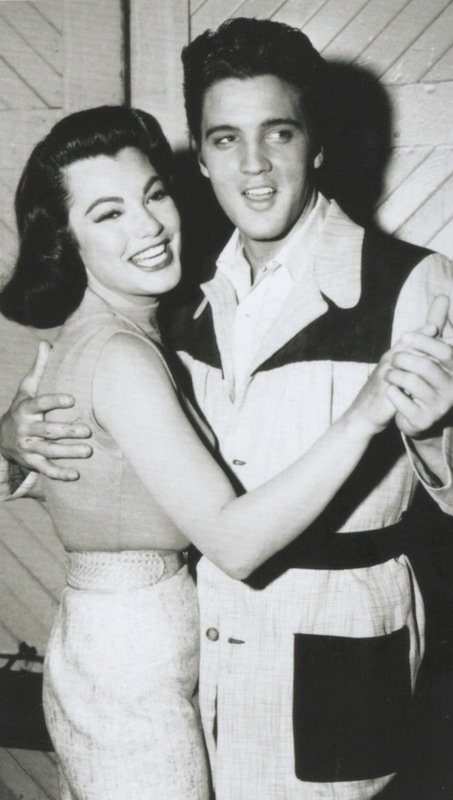 Since Tyler was dressed conservatively throughout Jailhouse Rock, she appeared considerably older than Elvis. (Actually, at 24 she was only two years older than him.) 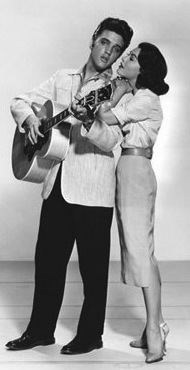 Judy had just two dramatic scenes in the film, first when Elvis’s character told her he was going to sell the recording company they started together, and the second when she told Elvis in the hospital that she loved him. Tyler handled the scenes well, but the briefness of both made them unmemorable in the context of the entire film. 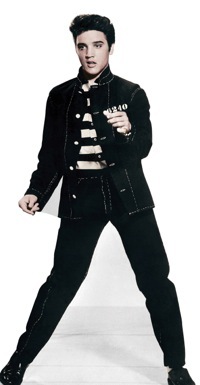 Judy also exhibited some athleticism in Jailhouse Rock. She twice chased Elvis down from behind on the sidewalk, wearing high heels both times. • Did Elvis and Judy have a thing going on? After principal photography on Jailhouse Rock ended on June 14, 1957, Judy and her husband decided to drive rather than fly to New York City, where she was due to appear on the CBS-TV program Pantomime Quiz. The couple chose to drive the mid-West route across the country through Wyoming. In the early evening of July 3, their 1957 Chevrolet approached “Wild Bill’s Curio Store and Petting Zoo” on US Highway 30, three miles north of Rock River, Wyoming. When a car pulled out of the tourist site onto the highway, LaFayette swerved, sending the couple’s car skidding into the oncoming lane. Their car was hit broadside by an northbound vehicle. Judy was killed instantly; her husband died the next day in a Laramie hospital from chest and back injuries. Also dead at the scene was a passenger in the other car. The only survivor of the collision was the other driver. Although Judy Tyler was not well known nationally at the time, newspapers across the country printed wire service articles on her death in the days that followed. Conflicting elements in those early accounts have left details about the accident and its aftermath unresolved to this day. Ted Smith’s assertion in the Memphis Commercial-Appeal that Judy Tyler’s body was “severed by the impact” continues to feed a belief over 50 years later that her body was cut in two. None of the other stories that appeared in the national press at the time contained that claim, including The New York Times, which cited on-scene patrolman Paul Thresher as a source. A few contemporary reports and many on-line sources today also contend that cash, furs, and jewelry were stolen from the Tyler car after the accident. However, other accounts indicate that a Milwaukee detective returned the couple’s personal effects to their families. Gregory LaFayette’s age at the time of his death is also in question. Smith, in his Commercial Appealarticle, cited an MGM spokesman as saying “both Miss Tyler and her husband were 24.” Those ages were universally reported at the time of the accident, but current evidence indicates that LaFayette was born on January 23, 1938, which would have made him 19 years old at the time of his death. 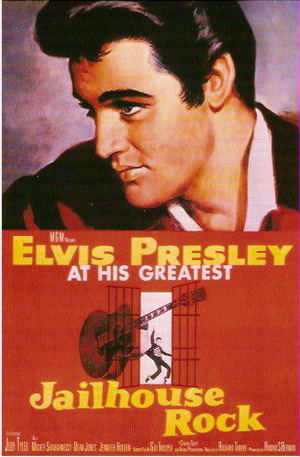 Elvis told Smith he planned on attending Tyler’s funeral in New York, even if it meant missing the Memphis premiere of his film Loving You scheduled for the following Tuesday. 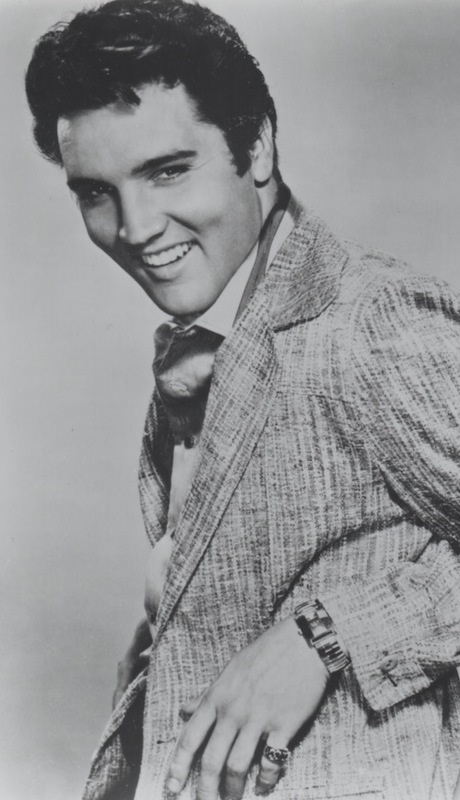 A few days later, however, the Presley family issued a statement saying Elvis would not attend the funeral because he didn’t want to create a disturbance. Judy Tyler’s ashes were interred at Ferncliff Cemetery in Hartsdale, New York. Her husband was buried in his hometown of Hopewell Junction, New York. 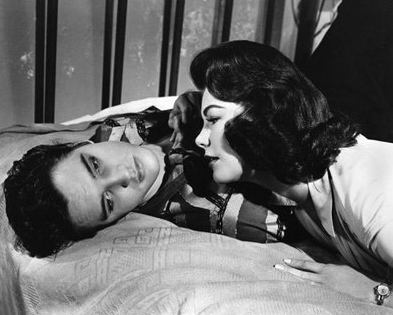 When the film was released nationally in November 1957, reviewers were kind to Judy Tyler. Since she was dead by then, the writers apparently saw no need to analyze her work in detail, and so usually provided only passing remarks. Following are some of references to Tyler in the initial reviews of Jailhouse Rock. "Judy Tyler, as a pretty record promoter who helps the crude young singer to success, gives a performance that makes her untimely death seem all the sadder."